Last Wednesday, the representatives of the European Parliament, European Commission and Council of Ministers came to an agreement on the final text of the new version of Energy Performance in Buildings Directive. The next step is for the Council to formally adopt the version, but in fact the major decisions were already taken. Our next 10 years are pretty much “shaped” when it comes to energy efficiency in buildings. The final version is weaker than the version that was successfully voted by the European Parliament in April. We were expecting that the text to be modified in the negotiation process and some compromises to be made, but the final result is more a collection of recommendations than a powerful tool that could significantly contribute to saving energy in the European buildings in the years to come. For the most advanced countries – were the national legislation and standards are very powerful (eg. UK – all new buildings – carbon neutral starting from 2016) is not a big loss but for Eastern and Central Europe it is. In this region the national legislations are shaped mostly on the European Directives – if we have a strong Directive we have strong national legislation, if we have a Directive full of recommendations ….sometimes we listen and if we are lucky we look at the other Members States for best practices, we admire and start making a huge list of reasons for why not we cannot implement that measure or that mechanism or why we cannot allocate funds from the public budget …….and the list is long. No concrete requirements for Member States to introduce targets to renovate existing buildings according to nearly zero energy buildings. They were not supposed to renovate the whole existing building stocks to this standard, but at least to consider this aspect to a minimum percentage of buildings that are renovated. 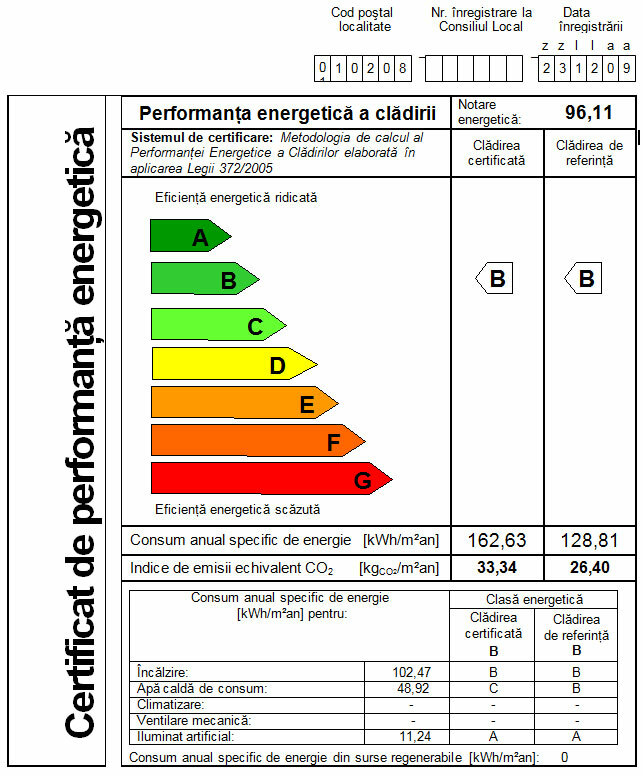 No obligation for certifying and displaying the energy performance certificate in case of public buildings, unless they are bigger than 500sqm (the threshold will be lowered to 250 sqm in five years) and visited by the public. However an important number of public buildings will not be included in this category. Fiscal and financial incentives were introduced only as recommendations and not as obligations. Practically it will be up to each Member State to allocate or not funds from the state budget for putting in place measures to support the implementation of EPBD. The terms for applying the provisions of the new EPBD were delayed with two years after it comes into force. Practically – if the law will be adopted in 2010 (expected to happen) the Member States are supposed to publish the transposing measures in 2 years after the entry into force. Next stage already started – we (RoGBC together with WWF Romania and other representatives of the non-governmental sector) will have to continue our initiatives at the national level and lobby for proper implementation of EPBD and adoption of real measures that will contribute to encouraging the energy efficiency in buildings and promotion of renewable energy production. The new version of EPBD offers some good arguments in the discussions, but it is a weaker tool than what it could have been. The final text of the directive is available here. 2. European Parliament is not in a hurry. Ms. Ticau said she won’t make a compromise on a weak Directive and if agreement is not obtained by December they will start the normal co-decision procedure that might take some time. The European Parliament (EP) wants to have an agreement soon, but not in the detriment of the content. Strong points that EP doesn’t want to make a compromise on – common methodology for calculation, setting energy efficiency requirements for building components , fiscal and financial measures to support the implementation of the Directive, net zero energy buildings. 3. Another important point – if the three institution fail to reach an agreement by December – the process might take much longer afterwords (Ms. Ticau was saying that some Directives are discussed in the Council for years). The opportunity we have now is that the three institutions that are now negotiating – European Parliament, Council of Ministers, European Commission feel some pressure from achieving an agreement before Copenhagen – to demonstrate leadership in the negotiation there. RoGBC decided to ask the other Green Building Councils in Europe (18 organizations) to start lobbying heavily at their national level for their governments to support an agreement at the EU level on a strong EPBD. This would help creating the needed market conditions all over EU for developing energy efficient buildings and rehabilitating the existing ones. Anca Bieru, Membership & Public Affairs Director for the RoGBC, met yesterday in Brussels with Adriana Ticau, Member of the European Parliament (MEP), to lobby for the position of the RoGBC regarding the new Directive for Energy Performance in Buildings (EPBD). Representatives of the Council and WWF Danube-Carpathian Programme Romania have written a position paper addressed to the MEP Adriana Ticau, with the purpose of encouraging the progressive position of the European Parliament in the Trialogue Negotiations starting this month to obtain an agreement on the recast of EPBD. The message of the position paper is one supporting the adoption of an “ambitious recast of the Directive, as it resulted from the European Parliament vote” and the idea of maintaining an inter-institutional negotiation. The text of the position paper is available for reading here. Organizers: the Association of Energy Auditors for Buildings (AAEC) in collaboration with Commission of Industries and Services, with the support of the Chamber of Deputies.